​Explore your Inner Self through sounds & techniques inspired by the ancient tantric science of Nada Yoga. The meditation workshop (17:00-19:00) is focussed towards taking you on an inner journey and invoking the natural rhythms and spaces of your physical being, giving you the ability to enjoy the present moment in deep relaxation and awareness. 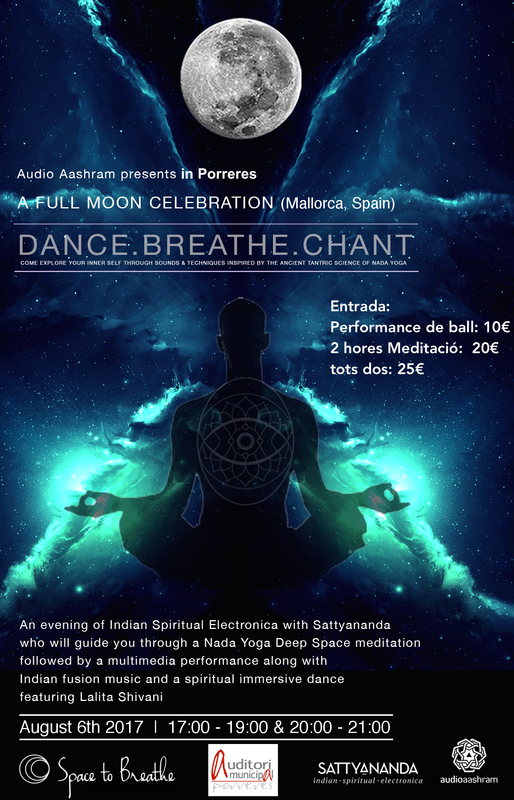 Join us for a Full Moon celebration of Indian Spiritual Electronica with Sattyananda who will guide you through a Nada Yoga Deep Space Meditation, followed by an extraordinary multimedia dance performance by Lalita Shivani. Sattyananda is a musician and Nada Yogi from India. “Nada” means sound, and Nada Yoga is the Yoga of sound. He combines his experience of these meditative practices along with his knowledge of technology to weave sonic meditation experience for the modern generation to easily experience inner peace and tranquility. He believes that sound has the power to heal, to help you relax, to help you contemplate and to bring about deep joy and happiness.